For the past two years, since our local affiliate added a social media committee, my friend Karen and I have been the social media co-chairs for the Komen Southern Nevada Race for the Cure. I actually started volunteering for them when I first moved to Las Vegas. I wasn’t working, and needed to do something and meet people. It was probably one of the best things I have done for myself. Thankfully, our local affiliate is filled with amazing people. Our Race Day committee is AMAZING! Every year, I am proud to be a part of such a magnificent event. As the social media committee, we actually work year round. We update the twitter and facebook accounts, and have since added other things such as pinterest, foursquare and will continue to grow. On race day, we joke that we log way more miles than the 3 everyone else is there to run. By the awards ceremony, we were over 5 miles. We had over 1,000 pics between the two of us, that we are STILL sorting through, and, amazing memories. We are lucky enough to get up on stage before the race starts. I took pics this year of the street before it filled up, and as it was filling (we are working on an amazing timeline clip). To be standing there before the starting gun and watch over 10,000 people standing in that street, unified for the same reason… to say it is overwhelming is an understatement. It is truly moving and breathtaking. Every year, it brings tears to my eyes. To see the survivors, hear their stories…. Truly moving. This year, I got a chance to meet my inspiration. I saw her last year, and didn’t get a chance to talk to her. Her name is Mary. She is a 17 year breast cancer survivor from Alaska. She runs the race in Vegas every year. She runs it in around 32 minutes (give or take), she is 75 years old. Yes, 75. 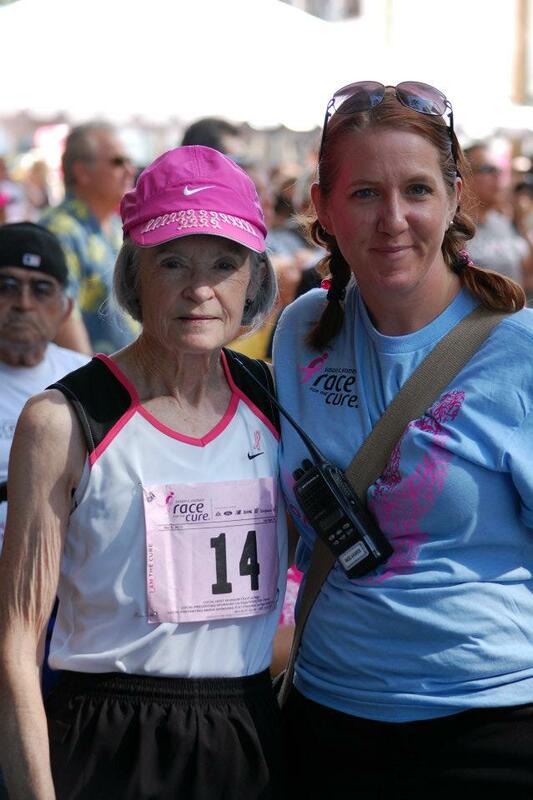 She started running more when she was diagnosed. I told her how inspiring I thought she was. She chatted with me about recently being snowed in up in Alaska and how she had to get chiseled out so she could go on a cruise (where she also ran a 5k on the deck). She graciously posed for a pic with me, and, smiled from ear to ear when the Chippendales gave her her award for Masters Division. Yes, the Chippendales give the awards…. we are Vegas after all! And, since I mentioned them, this year’s Chippendales giving awards! But, seeing her, talking with her, made something click in my head. I realized my funk lately is because I have been unfocused, and my goals are all over the place, and I found myself asking myself why I run. I know why I started, but, why am I still doing it, what do I want to accomplish with it? So, the rest of the weekend was spent finally resting, deep in thought, curled up with two great dogs. (Oh, and I did a 5 mile run).